David Weekley Homes, the nation’s largest privately-held home builder, is offering its unique line of Imagination and Designer Series homes at Shearwater, Freehold Communities’ new master-planned community in St. Johns County. The Bumblebee floor plan provides plenty of space for entertaining and relaxation, and with various personalization options, it’s never been easier to create the ideal home for you and your family. The Bumblebee is a single-story home that features three bedrooms, two full bathrooms, an additional study, a gracious front porch and a covered lanai. At approximately 1,740 square feet with a two-car garage, this home offers plenty of living space, while maintaining a warm and cozy feeling. Pricing starts in the mid $200,000s. The Bumblebee is your place to relax. Soaring 10-foot ceilings make the home feel open and luxurious, and optional tray ceilings in the Owner’s Retreat and study add an extra touch of elegance. The spacious Owner’s Retreat is complete with an extra-large, walk-in Super Shower, making it feel like you have your very own personal spa. 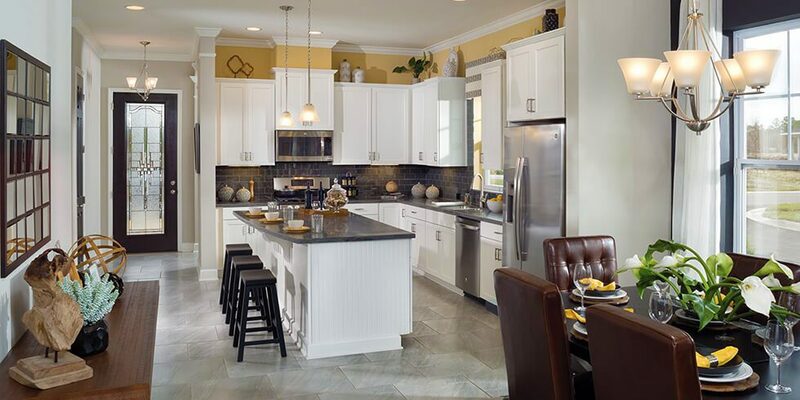 The Bumblebee is just one of many floor plan options offered by David Weekley Homes at Shearwater. Homes are situated on 40- or 50-foot homesites. With homes ranging in size from approximately 1,637 to 2,862 square feet with two to five bedrooms and two to four bathrooms, there’s something for every family at Shearwater. Click here for a 3D virtual tour of The Bumblee floor plan. For more information on The Bumblebee floor plan, or any of the homes being offered by David Weekley Homes at Shearwater, come tour the models and experience them for yourself. David Weekley Homes’ models are open Monday through Saturday from 10 a.m. – 6 p.m. and Sundays from noon-6 p.m. The other home builders at Shearwater include Lennar, Richmond American Homes, Mastercraft Builder Group, D.S. Ware Homes and Drees Homes. You can view our builders’ model hours here.